Bangla is the official language of Bangladesh. It is written in the Bengali script and is almost identical with the language Bengali, spoken in eastern India. The terms Bangla and Bengali are often used interchangeably. The Bangla language played an important role in the fight for independence from Pakistan. On February 21st, 1952 police fired upon protesters rallying for Bangla to be declared one of the state languages of Pakistan. Those who died in the shootings are honored as Language Martyrs and honored every February 21st. In 1956, Bengali was declared a state language of Pakistan, and when Bangladesh won independence in 1971, Bangla was declared the official language. Although many in Bangladesh, especially in urban areas, also speak English fluently, Bangla plays an important role for national identity and in the interactions of everyday life. In 1999, based on a proposal initiated by Bangladesh and supported by many other countries, UNESCO declared February 21st as "International Mother Language Day." The day honors efforts worldwide to preserve and enhance national, regional, and local languages. 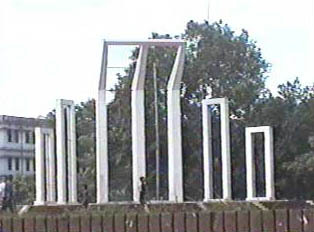 The image to the right shows the Shaheed Minaar, a monument constructed in honor of the martyrs of the Language Movement of 1952. "The Fight for the Bangla Language"